This edition of Sonorities celebrates artistic collaboration by showcasing new work developed in the context of the Comedia Culture 2007 European project. This year’s festival extends from Belfast to Graz in Austria and Hamburg in Germany through a vibrant and eclectic collective of musicians, coming together to perform in, on and across the network. As the use of computer networks increasingly influences our daily lives and the way we approach artwork, social interaction and creativity, we feature three days of events which present experimental and groundbreaking work in the field of network performance as well as revisiting 20th Century classics performed across Europe. Along with highlights such as grandfathers of networked music The Hub, pianist and composer Chris Brown, invited artists include Carin Levine (flute) and Evan Parker (saxophone) who will be performing new network-centric pieces by artists associated with the Sonic Arts Research Centre and the Comedia project including Pedro Rebelo, Franziska Schroeder, Andrea Szigetvári, Felipe Hickmann, Rui Chaves, Justin Yang, Patricia Alessandrini, Shirin Abu Shaqra, Alain Renaud, Imogene Newland, Pierre Proske, Robert King, Winfried Ritsch and The European Bridges Ensemble amongst others. The festival culminates in a concert by an improvised music collective directed by Evan Parker. The Two Thousand + Ten symposium has been running alongside the festival since 2006, providing a platform for creating relationships between a public artistic program and an interdisciplinary critical platform speakers from fields such as new media, choreography, music technology, musicology, sociology and philosophy. This year’s symposium focuses on improvisation and includes keynote addresses by Georgina Born and David Borgo. 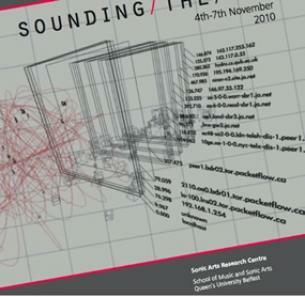 Join us for this unique event of network music, dance, interactive video and installation staged between Belfast’s Sonic Arts Research Centre, Graz’s Institut für Elektronische Musik und Akustik and Hamburg’s Hochschule für Musik und Theater. Performed by Franziska Schroeder and Steve Davis (Belfast), Clemens Frühstück, Elisabeth Harnik and Summerer Reinhard (Graz), and Carola Schaal, Stefen Weinzierl and Turo Grolimund and the European Bridges Ensemble (Hamburg).